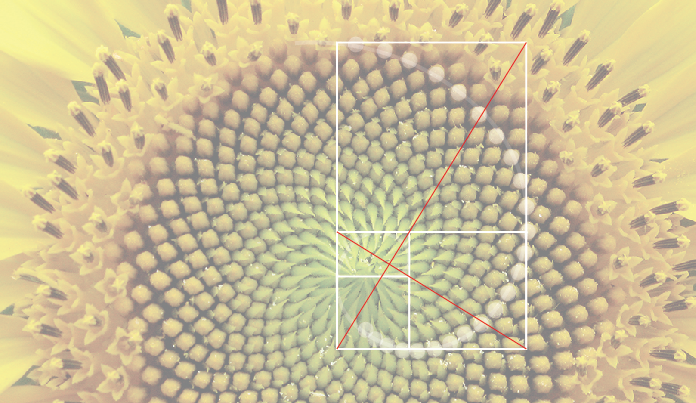 The golden rectangle has been associated with the growth pattern of living things. Subconsciously, this organic pattern resonates with us. 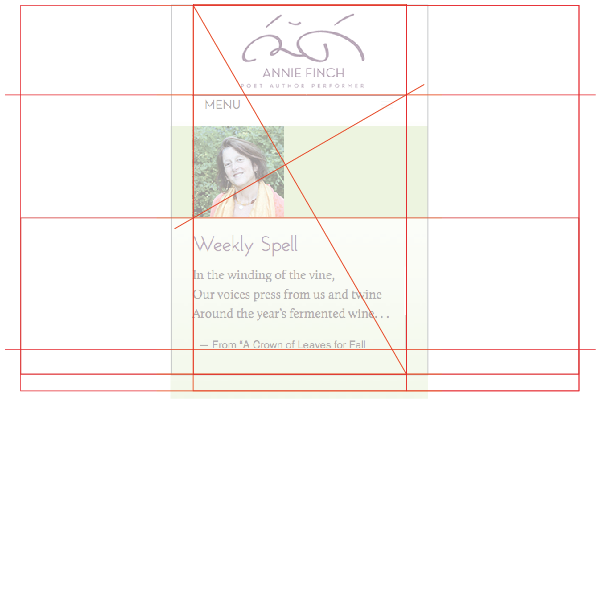 This same golden rectangle is of particular use to the web designer who’s interested, not only in harmoniously composing visual elements on a web page, but in setting up what could be called visual meridians along which viewers can scan web page content. If it’s used with care it can help readers to conceptually organize this content. In the face of ever-changing web content, and always-proliferating viewing devices, the idea of using fixed, two-dimensional proportions — typically used in the domain of print design — has largely been set aside by many web designers as unworkable and inefficient. 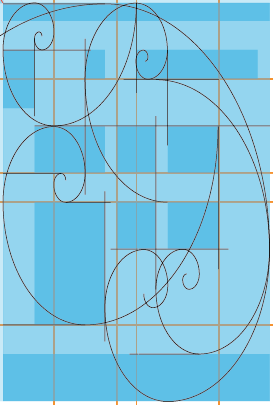 In what follows I’ll present the benefits of, and practical methods for, using the fixed proportions of the golden ratio as a basis for designing clear web page layouts. With a little help from CSS pre-processors, CSS media queries, and a good jQuery content scroller, there’s no longer a reason why a designer can’t adapt these proportions to a mobile phone, tablet or the next “net fridge”. The greatest obstacle is that it requires a re-examination of the view that the optimal approach to page design for the Web is to be found in the fluid layout. This entry was posted in Holistic Visual Communications on May 26, 2015 by Alex. What does this Greek vase and this web page for the new Apple Watch have in common? Find out at the Geometry and Design mini-workshop. This 3-hour workshop is $45 per person, and includes paper, pencils, compass and straight edge ruler. 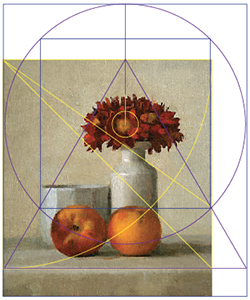 A brief presentation of visual arts that have made use of the Golden Ratio will be given. The workshop will be held from 1:00pm to 4:00pm, on Saturday, May 2nd. There will be a scheduled break from 2:30pm to 3:00pm. Click below to reserve a spot! This entry was posted in Holistic Visual Communications on April 23, 2015 by Alex. Fluid web page layouts are very 2010. I have to confess that, over the past 5 years, I’ve spent way too much time staring at the web pages of fluid sites, mesmerized by the elements on these pages as they squish and expand, like an accordion, based on how wide I would make my browser window. This entry was posted in Holistic Visual Communications on March 24, 2015 by Alex. The founder of a startup business decides to redesign the look and feel of his website. He wants to find a way to better connect with his audience, and needs to have the design work as well on a mobile device as it does on a desktop computer. One morning, after preparing his coffee, he fires up his laptop, and heads over to wordpress.org/themes. His optimism grows as he reads that WordPress has 2,901 free themes to choose from. He types the words “sleek and earthy” into the Search field of the theme directory. These two words capture the essence of his startup’s service. WordPress displays several themes that match this search. He opens up the demos for these themes, and is discouraged to find that the look and feel of the themes are very different from the particular sleek-and-earthiness that he’s looking for. This imaginary scenario is not so far from reality. Why, for example, does WordPress’s “Enigma” theme not feel very enigmatic to me? Sure, the theme’s Home page includes a big banner of a nighttime-in-the-city scene, but the general layout of the page doesn’t resonate with what I would consider enigmatic, or mysterious. This is where a custom website becomes a smart alternative to readymade themes. I recently designed a custom site for Annie Finch, a noted American poet. Over the course of several discussions with Annie — discussions about the idea or feeling that she wanted the look of her site to communicate — some of the recurring qualities that came up were earthy, natural, elemental and sleek. In many of our talks there was also a strong undercurrent related to the activity of birthing and mothering. 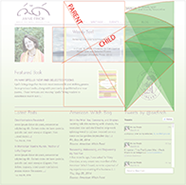 The activity behind creative works are often compared to birth giving, and this comparison was very clear in Annie’s participation in the design of her site. 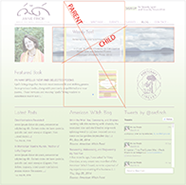 It was hard not to connect the Home page of the new site with one of Annie’s books, titled Home Birth (a collection of poems about pregnancy, birth and nursing). Based on all of these exchanges I developed several visual compositions. After a number of revisions we arrived at a visual layout that we felt most clearly communicated these qualities and activities. 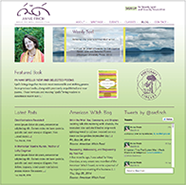 On the face of it the visual composition of the website’s Home page includes a portrait of the poet, and a scene from nature: a lake where Annie likes to work. Behind this face there’s the visual composition’s undercurrent or understructure. This understructure is made up of a series of invisible, abstract areas. These areas are arranged to subconsciously communicate1 the relationship between the Parent and the Child. The quality of Nature is also represented. This is done by incorporating what mathematicians call the Root 5 Rectangle, an area that relates to proportions found in the growth of natural organisms. When you click on the second thumbnail image below you’ll see the spatial relationship that exists between the Parent and the Child. 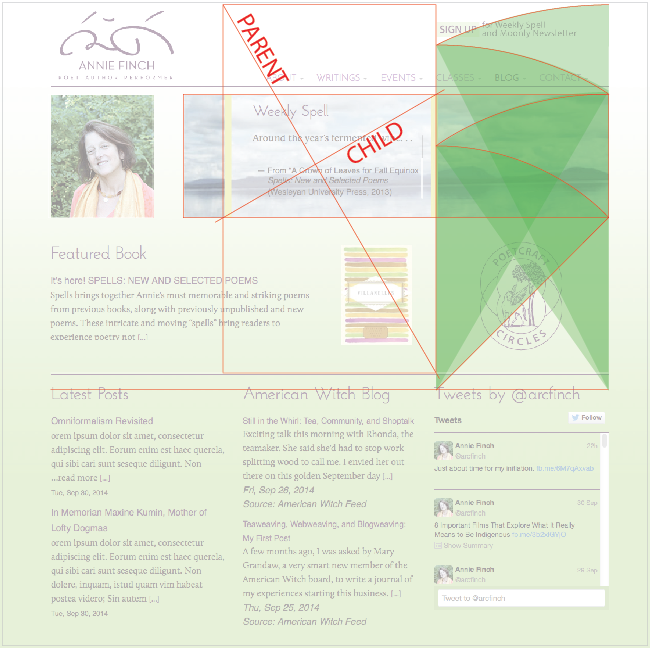 Here, the Parent is the vertically-oriented, central rectangle of the Home page (represented by its diagonal), and the Child is the smaller, horizontally-oriented rectangle that’s nested inside the Parent. The Child possesses the same proportions as the Parent. It’s a microcosm of the Parent. Both of these rectangles, although different in scale, are related to the proportions of the equilateral triangle. This Child area is reserved for what Annie calls her Weekly Spells. When you click on the third thumbnail image you’ll see how the lateral regions of the Home page are connected to the unfolding of the Root 5 Rectangle. The first and third “moves” of this upward unfolding correspond with the upper and lower boundaries of the lake image. 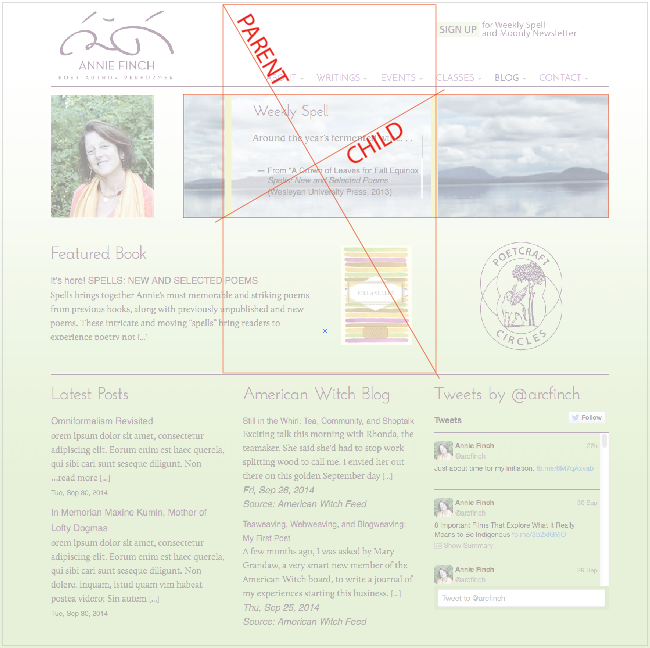 The Home page is a story about Annie’s work, but it also becomes a story about the connection between the Parent, the Child and Nature. 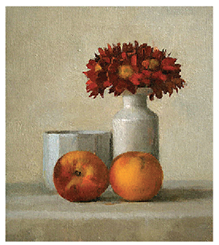 It’s important to keep in mind that there is no formula to setting up these abstract areas. If the content of the Home page were to undergo some significant changes then a new arrangement of abstract areas would be needed. 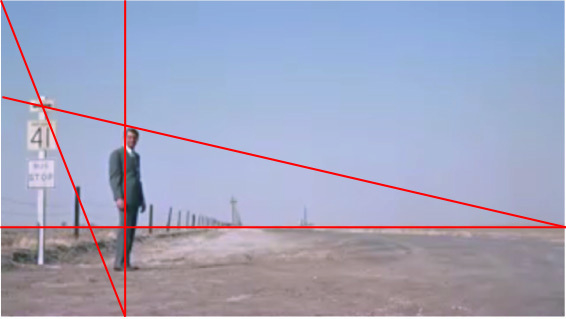 The goal of this new visual arrangement would still be to communicate the same qualities as before. The challenge in developing layouts across different viewing devices is to apply device-specific understructures that will communicate the same qualities. There are many different ways to do this, and for the portrait version of a smartphone I decided to simply scale down the original understructure in a way that would correspond to the proportions of the smartphone’s viewfinder. The amazing thing about human perception is that a person can “fill in the blanks” in cases where parts of the composition do not fall within the boundaries of the screen, window or viewfinder. This is not too different from the Closure principle of the Gestalt theory of visual perception. For the mobile version of Annie’s Home page only about half of the understructure lies within the viewport (see Figure 5). The Parent/Child and Root-5 relationships are maintained, but most of the Root-5 areas fall outside of the viewport. It has been said that human beings are attuned to seeing/feeling certain proportions, and that these proportions wash over us when we take in visual impressions of the natural world2. These proportions relate to the growth and movement of living organisms. Despite the fact that most of the Root-5 areas are outside of the smartphone’s viewport the arrangement of the visual elements that fall within this viewable area is such that the Root-5 areas are implied (see Figure 6). In this way the relationships between the Parent, the Child and Nature are maintained. Designing web pages in this way would require a shift in the way that people think about user interfaces. A user interface can be based on a visual hierarchy that helps the viewer navigate the page, and it can also be used as a field where proportional relationships support the story that one wishes to share. Beyond user interfaces the design process that I’ve described here would require a change of attitude in how we think about productivity. The speed of production has to be measured alongside of the quality of production. 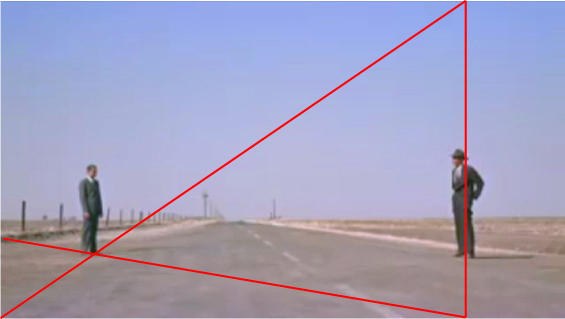 1These invisible areas have been used for millennia. Perhaps the closest thing to this that can be found over the past hundred years is the European theory of gestalt and, more specifically, the principle of closure. 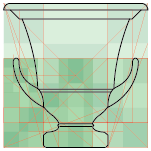 2See The Elements of Dynamic Symmetry, by Jay Hambidge. This entry was posted in Holistic Visual Communications on October 5, 2014 by Alex. This entry was posted in Holistic Visual Communications on July 21, 2014 by Alex. 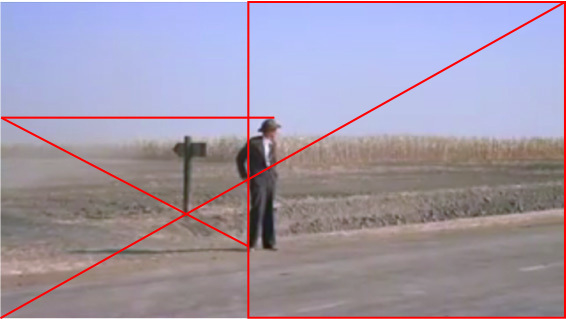 Here are some studies that I made from the crop duster scene of Alfred Hitchcock’s classic film. Another example of how the positions of visual elements are intentionally related to the visual whole. This entry was posted in Holistic Visual Communications on June 27, 2014 by Alex. This entry was posted in Holistic Visual Communications on March 25, 2014 by Alex. 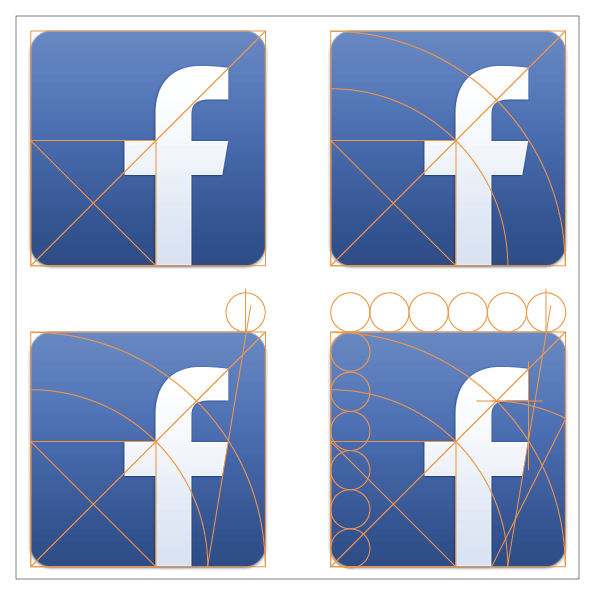 I recently began to wonder about the design of Facebook’s “f” logo. I felt something very precise and deliberate in the placement of the white letter “f” within the blue square. This feeling, along with the subtle diagonal at the end of the letter’s cross stroke, made it impossible for me to resist doing yet another geometric study. According to traditional Western pictorial composition, our letter “f” is decidedly moving forward (that is, to the right) within its square blue stage. The base of the letter is thoroughly grounded at the bottom of the square, while it’s whispering bevel suggests an upward movement. What if there was a similar geometry in the design of an orchid? This entry was posted in Holistic Visual Communications on March 6, 2014 by Alex. This entry was posted in Holistic Visual Communications on February 13, 2014 by Alex. 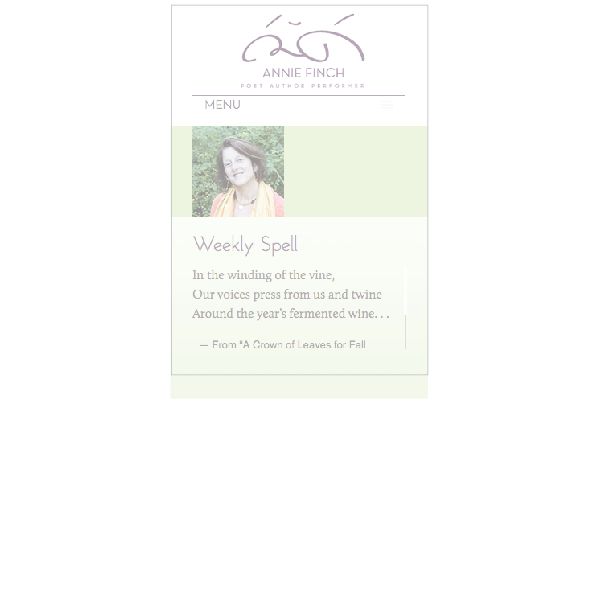 This entry was posted in Holistic Visual Communications on December 3, 2013 by Alex.